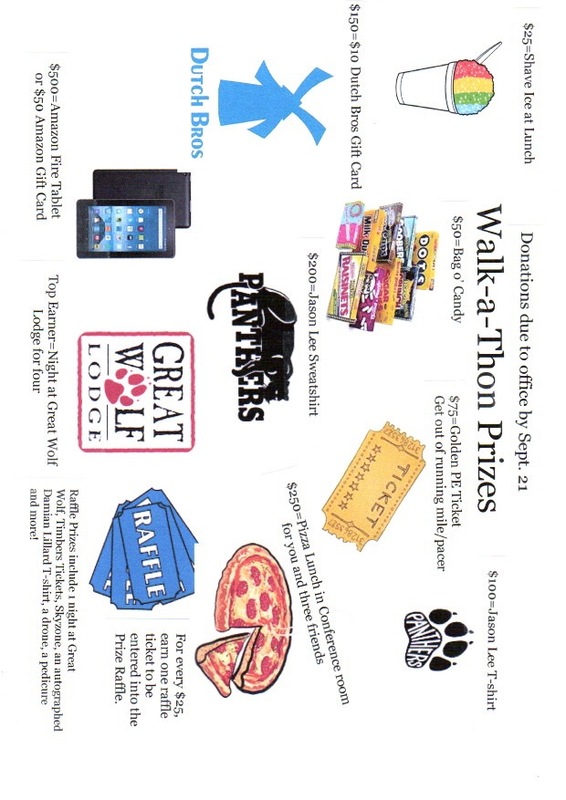 The JLMS PTA will be hosting our fourth Walk-A-Thon on Friday, September 21, 2018 from 2:30 – 3:30 p.m. The course is a 1 mile loop around the school property with a Walker Lane as well as a Runner Lane. Panther pride with every stride! This is our one and only fundraiser for the year! We are asking for flat fee donations so students don’t have to go back to tell people how many laps they have completed. All donations are tax deductible. 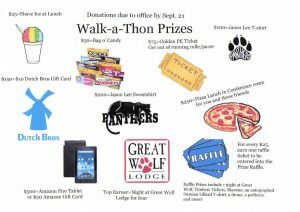 Packets will come home from school on Friday, Sept. 7, or make a donation at the PTA website JLPTA.org. PRIZE RAFFLE: For every $25 brought in, you will receive one raffle ticket for the prize raffle which will include a night at Great Wolf, Timbers Tickets, an autographed Damian Lillard T-shirt, a drone, gift certificate for pedicure and much more! If you make a donation through the website, don’t forget to include the student’s name! We want to make sure that everyone gets credit for all the donations they bring in!